In a gallon-size freezer bag, dissolve 1/4 cup of kosher salt in the warm water. Add the remaining brine ingredients, including the pork. Brine for exactly 20 minutes. The pork becomes mealy if its brined longer. Meanwhile, prepare the Blackberry Hoisin Ginger Glaze by melting 1 tablespoon butter in a small saucepan over medium heat. Add garlic, ginger and red pepper flakes and saute for 30 seconds. Stir in blackberry preserves, hoisin sauce, red wine vinegar, salt and pepper. Taste and add more red pepper flakes if desired, remembering that the glaze will be less “spicy” because only a little is drizzled over each serving. At exactly 20 minutes, remove the pork from the brine and pat dry. Rub the pork all over with 1 tablespoon olive oil, followed by 1 teaspoon salt and 1 teaspoon freshly cracked pepper. Heat 1 tablespoon of oil in a large nonstick skillet over medium high heat. When oil is very hot and rippling, add pork tenderloin. Sear each side until browned, approximately 1-2 minutes per side. Place tenderloin on rack in shallow roasting pan or a rack paced on a baking sheet. Brush with Blackberry Hoisin Ginger Glaze, brushing again after 15 minutes of cooking. Roast approximately 25 to 30 minutes or until until an internal thermometer inserted into the thickest part of the tenderloin registers between 145 and 150 degrees F (63 and 65 degrees C). This means the pork will be juicy and slightly pink in the middle. If you don’t want any pink, then cook a little longer, being careful not to overcook or it will dry out. When pork is done, let stand 10 minutes before slicing. Meanwhile, warm the sauce. 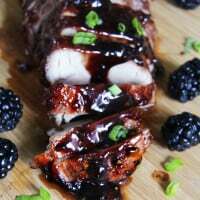 Slice pork thinly then drizzle with Blackberry Hoisin Ginger Glaze – either on a platter or on individual servings.